As a young boy, Chris Otto developed an interest for flying by watching a tv show about flying. He later learned about the scientific principles of flight and the technological tools that enable planes to fly.He simply knew that he would be an aviator. Now a 30 year old pilot, Mr. Otto has realized his dream. Chris and his wife Caitlin, who is also a pilot, are both Citizen Teachers for the “Flying Together” apprenticeship at Monroe Elementary. 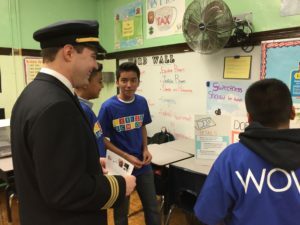 Together, they are teaching their passion for aviation to students, providing them with a unique opportunity that they may not have had otherwise. Thank you for allowing us to interview you both for our Citizen Teacher Highlight and welcome you as the new Associate Board members! Why don’t you share with us why you decided to become a Citizen Teacher. Chris: Sure. One day, when I was on the beach with some friends, our conversation turned to education. I had just watcheda documentary called "Waiting for Superman", which focuses on reforming America’s public education system so that kids are encouraged to learn by improving the schools in our own communities. That's when one of my friends told me about Citizen Schools and how I could teach students in underserved communities about my passion for aviation. I remember how exciting it was for me to learn about aviation as a young kid and I thought Citizen Schools was the perfect way for me to be part of the solution to address some of the challenges through exposing students to the world of aviation. Caitlin: Well, my husband [Chris] and our good friend had developed the “United Flying Together” curriculum for the apprenticeship. They had been teaching it for two years and I sometimes helped in small ways with the planning but was nervous about whether I would be a good teacher. After going to two WOW's (where Citizen Schools students present their final projects), I was so impressed with how much the students had learned and their enthusiasm for answering my questions! Seeing the excitement on the students’ faces really sealed the deal for me and I started volunteering the following year. I just started my third semester volunteering as a Citizen Teacher. Are there any skills you developed as a Citizen Teacher? Caitlin: Well, prior to my first semester volunteering for Citizen Schools, I was very nervous about teaching a classroom full of middle school children because I was somewhat shy about public speaking. I had previous experience teaching, but it was in a one-on-one flight instruction environment. I decided to volunteer, but in a supportive role and allowed other more experienced Citizen Teachers take the lead for the first few weeks. Then one week, only one other volunteer and myself were going to be able to make it to class (we usually had 4 Citizen Teachers), and I was much more comfortable with the subject matter that week so we decided that I would lead the class. I was extremely nervous but the class went incredibly well! I felt that my few short weeks of teamwork and support from Citizen Schools gave me the extra confidence and classroom management skills to lead the students through the activities and keep them engaged. Chris, as veteran Citizen Teacher who has now taught five years, what motivates you to continue to volunteer as a Citizen Teacher every year? Chris: I believe in Citizen Schools’ philosophy that there is a real opportunity gap for students in poorer neighborhoods. After working with these students for 5 semesters now it's easy to see that we have so much talent and wonderful minds in our schools. To hear the statistics about CPS students and graduation rates and apply that to the students that I have taught is heartbreaking. To learn that I taught several kids who won't even graduate high school makes me want to do more for these bright willing minds. When I think back on how I fell in love with flying, I think many people can look back in their life and find a single moment or point to a single teacher that dramatically changed the course of their lives. Those moments intersect our path throughout our lives. Unfortunately, those moments are becoming more seldom. Our young students are being disadvantaged through no fault of their own but simply because of the neighborhood into which they were born. Can you describe an experience with a student that shows us that when given the opportunity, they can discover, learn and succeed? Chris: A couple of years ago I was teaching a class with other pilots, including my friend Kara. One student, Neftaly, pulled Kara aside after class one day and told her that she never knew that girls could be pilots. When Kara explained to her that it was possible for her to fly she was absolutely amazed and inspired. Neftaly brought a huge smile and unwavering enthusiasm to every class. It was a joy to watch Neftaly getting just as excited about aviation as I had been at that age. Caitlin: Oh yes, I remember Neftaly! I met her at a WOW! presentation the year before I started volunteering. She is an extremely bright, enthusiastic, confident young girl. She had made a close bond with a friend of mine that was teaching that year, Kara McKinney. After talking to Neftaly at the WOW! I had a chance to speak with her mother and she was so happy, and emotional at how much Neftaly had really blossomed since being in the apprenticeship. At the very end of the night after the students had all finished, Neftaly got up in front of all of her classmates and thanked Ms. McKinney for opening her eyes and showing her that women could do anything. I don't think there was a dry eye in the house! Being part of the fewer than 10% of female pilots in my industry, it is so important to me to encourage young girls to consider pursuing STEM fields. Chris: I want to share another story. During my first time teaching an apprenticeship to middle school students, in preparation for the WOW!, a Teaching Fellow asked a student to define Crew Resource Management. I was nervous about what the student would say. Even though we had taught it, this is a difficult subject that I really only started to learn about in college and didn't get much experience with it until I started my career with the airlines. I was blown away by his answer! He didn't simply recite a role definition of what he thought Crew Resource Management was but he gave an answer that an actual pilot would use at an airline interview! It was amazing to see how much he had absorbed from our class. Citizen Schools gives a huge thank you to Chris and Caitlin Otto for their unwavering commitment to our program!!! !